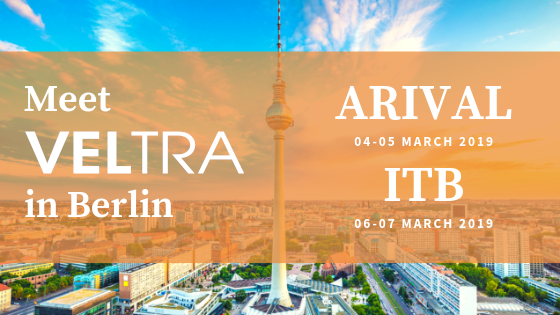 Two of the biggest travel events – Arival and ITB – will be staged back to back in Berlin next month. VELTRA is joining other industry leaders at the Mercure MOA for Arival 2019 on March 4 to 5. Arival, the In-Destination Event, is the go-to event for creators and sellers of the tours, activities & attractions sector. In the same week, ITB Berlin 2019 follows on March 6 to 10 at the Berlin ExpoCenter. ITB is the leading trade show of the worldwide travel industry and ITB Berlin the biggest travel show for the German public. Meet our Global Partner Solutions representative and learn about the VELTRA B2B partnership programs that best fit your business. Contact us to request a meeting for Arival (March 4 & 5) and ITB Berlin (March 6 & 7).